He has blurred the tracks with his rock star outfit but he has been inventing the most singular cigars in the world for thirteen years. 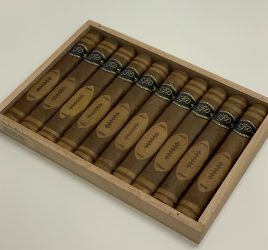 The forty-something Pete Johnson is the founder of the Tatuaje Brand, which cigars are made in Miami, Florida, and Esteli, Nicaragua by the famed José ‘Pepín’ García, the legendary founder of El Rey de los Habanos brand. If Pete’s edgy style (both his arms are fully covered with tattoos and he has a ponytail) has become relatively common in the cigar industry, his role as a trailblazer is well known. The fact is that not only did Pete sport a never before seen look in the industry but he knew nothing about it nor had any relationships in it when he started. Which didn’t prevent him from conquering it. 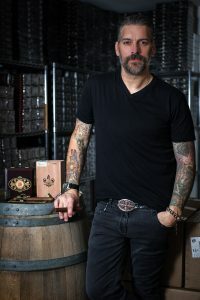 Cigars-Connect : How did the bassist of a rock band become one of the most successful cigar maker in the US? Pete Johnson: By pure passion! I came to Los Angeles in 1993 at the age of 18 from Maine where I grew up to make music on the Sunset Strip. At the time, the Hollywood portion of Sunset Boulevard was home to legendary clubs such as the Whisky or the Roxy. I started smoking cigars then and even smoked them on stage. Pretty soon, I couldn’t even part with my kit. Cigars-Connect : How did you go from before being an aficionado to being a cigar producer? Pete Johnson: The Sunset Strip started losing its appeal. It no longer was the Rock & Roll temple it had been, thanks to the new Grunge movement. My career as a bassist wasn’t taking off. I worked part-time as a bouncer. One day, the owner of Gus’s Smoke Shop, the cigar shop where I was buying my cigars offered me a part-time job. I was 23 at the time. Six months later, I was working there full time. I became their chief buyer. I fell in love with the industry. I smoked everything, wanted to know everything. The industry was so nice to me that I had to become part of it. Cigars-Connect : They welcomed you in spite of your tattoos? Pete Johnson: Yes! At the time, I think I was the only one to have full sleeves on my arms. It didn’t seem to be a problem. I wasn’t judged by that criteria and I was even more thankful to the industry for it. That being said, when I started working for the Grand Havana Room in Beverly Hills, I made sure to always cover my arms. Cigars-Connect : Tell us about those times. 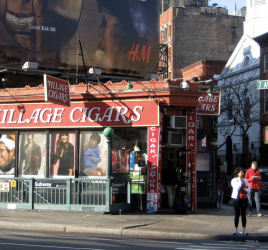 Pete Johnson: I had met the Grand Havana Room people while working at the cigar shop. We sold them our cigars. For those who have never heard of the Grand Havana Room, it’s a very exclusive club whose members are celebrities. I was recruited there as the director of retail after a short stint in New Orleans. The job opened doors for me. The most important one was my encounter with Pepin Garcia in 2003. I had tried to become a producer but it had not worked out. I felt pretty discouraged and ready to give up my dream. Pepin changed everything. His amazing generosity revived my hope. He taught me everything. I became part of his family. 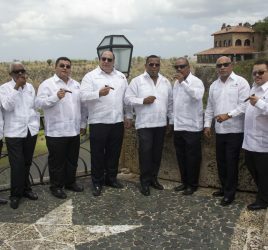 Cigars-Connect : How was the encounter? Pete Johnson: It was very simple and genuine. Pepin asked me what I liked, what I wanted. I told him I wanted a cigar on the stronger side. He rolled me a cigar right there and then. It was fantastic. A few months later, I had 50 boxes of each size. I still had no idea of where I might sell them. Thank God, the Grand Havana Room came to the rescue by allowing me to sell them. I had a very good trade show that year. Little by little, I increased my customer base. Cigars-Connect : Where does the name Tatuaje come from? Pete Johnson: Carlos Fuente and other people had nicknamed me “Tattoo Pete”. I had a OpusX tattoo on my arm. They loved it and took it to suggest my dedication to the cigar industry. It gave me the idea of naming my brand Tatuaje. Some people advised me against it because of the difficult prononciation in English. In the end, it turned out not to be a problem. Cigars-Connect : What does Tatuaje represent today? Pete Johnson: We have 22 brands (7 of which are old Cuban pre-embargo brands that were never trademarked, like El Triunfador, La Riqueza, Fausto), we produce 3 millions cigars/year manufactured by the Garcia family in Miami and Esteli, Nicaragua. The Garcias tell me what tobaccos are available to me and I instruct them on the blends and pick the patterns. I kind of see myself as a fashion designer. Cigars-Connect :You insist on living in LA, far from the industry’s heart. Isn’t it a problem? Pete Johnson: Los Angeles is my city and I love it. I have no intention of leaving it. It does mean that I spend a huge amount of time in airplanes though. Talking about traveling, one of the proudest moments of my professional life was seeing my cigars in a Champs-Elysées shop. Cigars-Connect : What are your three best-selling cigars? What are your personal favorites? Pete Johnson: Seleccion de Cazador, Tatuaje Havana 6 and Atelier. As for my personal taste, I smoke everything with a preference for La Vérité, a vintage cigar, one farm (the Estrella plantation in Esteli), one year, truest form of a puro. Cigars-Connect :You also make wine now? Pete Johnson: My other passion. I work with the Viniv vineyard in the Médoc region of France. They allow you to make you own vintage. I produced five of them. But that is another story!